While I was out with a couple of my newest girl friends a few weekends ago, they brought up the fact that they read my blog. This may seem a little strange, but I don't talk about the fact that I sew or have a blog with most of the people I see in my everyday life. In fact, I almost never bring it up unless someone specifically asks me about it. It's not that I'm embarrassed of what people will think of it (I'm not even sure most of the people who live here even know what a blog is) but I just feel awkward talking about myself and my blog to people who aren't actually interested. If someone is interested, however, I will proceed to talk a person's ear off about sewing and blogging! Which is what happened on this night. The girls mentioned that they enjoy reading my blog and that they would love to learn how to sew someday. I have been dreaming of starting some sort of sewing classes in my area as I have heard this from several other people as well, so what could be better than starting with two of my friends? We had our first lesson last night and it was a huge success! 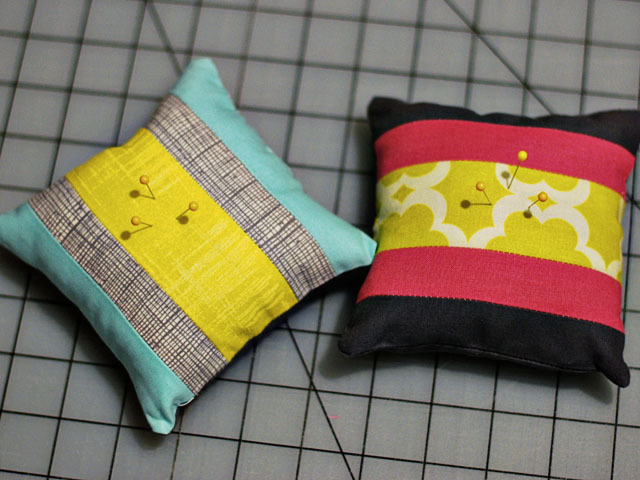 I had so much fun teaching them the basics of cutting fabric, using a sewing machine, figuring out seam allowances, pressing seams, etc., and we even finished our first project...weighted pincushions. and Kate made this super cute pink, chartreuse, and dark gray one. Aren't they adorable? It was so much fun watching them sort through my scraps, come up with a design, choose their fabrics, and sew these together. I think it's safe to say we'll be have more sewing classes in the very near future. We're already talking about what we'll make next! Thanks Jackie and Kate for being my guinea pigs! :) If anyone else happens to live in the UP/Northern WI area that would be interested in lessons, please send me an email! Oh I really wish I lived closer...I would LOVE to have some lessons! I'm pretty much just learning as I go at this point! I know exactly what you mean when you say that you feel awkward talking about your blog with most people. I'm the same way - I really don't discuss it with most of my friends. And a few close friends who don't sew but do read my blog tell me that it's like I'm speaking another language. : ) So how wonderful that your friends wanted to learn to sew! I'm glad the first lesson went well! Haha isn't it funny when your online life and your personal life come together? I feel the same way about talking crafts with people I know, but I had a sewing party with people who had never touched a machine and it was so much fun! Heather, we made an insert filled with split peas, and then put fiberfill on top of the insert to stuff the rest of the pillow. It worked pretty well! 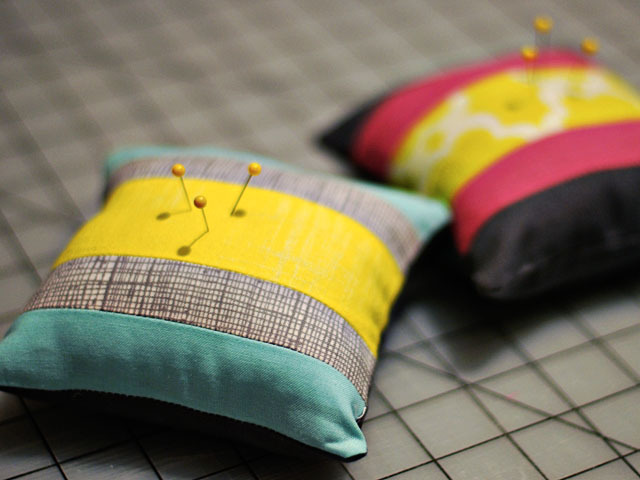 I'd love it if you'd teach a virtual sewing class -- for instance, I'd love to know how you made those adorable pin cushions! I also don't talk about my sewing blog life and then when a friend really is interested it all gushes out and I can't shut myself up! 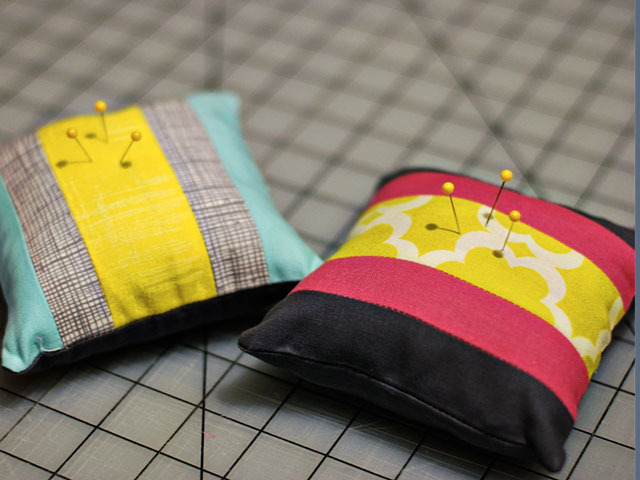 Your sewing lesson sounds great so fun! Sounds like a great start! Those are a very cute first project. I've thought of wanting to teach locally as well. I'm not sure how to begin. Those are so sweet! How fun! My best friend and I have been having sewing/knitting lesson swaps! I just love it. It is great to share your passions (and create new ones) with your friends! I feel the same way. I NEVER mention my blog to my "real-life" friends because I know they're not interested in sewing or blogging or creativity. They're amazed that I do any of those things, much less more than one! Clever - I will try that, thank you! How fabulous! What fun to be able to unite friends and sewing. And they did a great job!